We’re just going to warn you right now: if you are at all fearful of heights or suffer from vertigo, then this is a serious red zone. We’re not kidding; if you find yourself feeling faint at the sight of looking down from a fantastic height and seeing the ground as one would look down and see an ant, then avoid this at all costs – ESPECIALLY if it’s only showing in IMAX 3D. If this fits your description, then spend your well-earned money on Macbeth, The Martian or any other good film out right now. 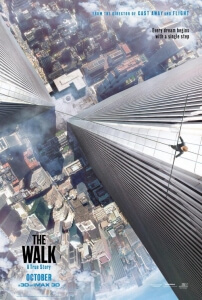 For anyone else, you have serious balls if you decide to watch Robert Zemeckis’ The Walk. Not that it’s necessarily a bad movie – on the contrary, it’s perfectly fine and though not an instant classic is certainly a likable enough flick – but man, whenever it reaches those literal heights, it’s damn near impossible to not hold onto the nearest solid object to your seat. The film is a dramatized account of French performance artist Phillipe Petit (Joseph Gordon-Levitt, rocking those CG blue eyes and a Pepé Le Pew-style accent) who, in 1974 New York City alongside a small group of accomplices, puts into motion a plan to hang a wire between the under-construction Twin Towers and – gulp – walk across it. You can guess right away which parts of the film are most likely to leave you feeling a little queasy. Now, as a film reviewer, it’s impossible to talk more about this film without talking about a certain other film that also covered this topic; in fact, comparisons with the Oscar-winning documentary Man on Wire are not only inevitable, they’re entirely necessary. If you desire a retelling of the incident that launched the real-life Petit to worldwide fame that’s more in depth and detailed, then we highly recommend watching Man on Wire; The Walk, on the other hand, takes a much more traditional and simplistic approach that keeps itself confined to the three-act structure and removes some of the rougher edges that the documentary presented to make it more accessible to moviegoers (that PG rating alone should prove that point). In dramatizing events leading up to a payoff which we all know is coming, Zemeckis still manages to keep things reasonably steady, though some detections of falsehood – his romance with fellow street performer Annie (Charlotte Le Bon) can’t help but feel somewhat contrived, especially considering alleged mistreatments of her by the real-life Petit, and Ben Kingsley’s accent-heavy mentor figure Papa Rudy – cause things to go wobbly for a little bit. In addition, a framing device of Petit talking directly to the audience from the top of the Statue of Liberty, with the Twin Towers in the background, is cute but occasionally suspends the tension whenever it cuts back to it from a particularly nerve-wracking scene in the narrative. This is a film that’s certainly more interested in bringing the entertainment value more than the informative, and for a good chunk of Zemeckis’ film it works fine, but not without its little hiccups here and there. But whenever the film actually moves the action to the top of the World Trade Center, that’s when the magic really comes into play. No actual footage of the death-defying tightrope walk itself exists, only in photographs taken by an accomplice, so the challenge is set for Zemeckis to fully recreate not only the walk that Petit made, but also a view that sadly no longer exists. Through a combination of practical sets recreating the top of the Towers to a CG background that replicates the skyline of 70s New York flawlessly with neat little touches here and there – a flock of birds, not even reaching the height of Petit’s wire, can be seen below – he pulls this off, but he one-ups himself by adding an extra ingredient. The IMAX 3D adds a depth perception that, whenever it dares to look down or even over the side, is instantaneous in its stomach-turning effect, and will have you squirming in your seat telling yourself over and over “it’s just visual effects” when he’s simply standing on the edge. As for the walk itself, it is surprisingly calm and collected, but is sure to also be one of the year’s most memorable show-stopping sequences, based on its technical achievements alone. Once again, we advise any sufferers of vertigo or anyone with a severe fear of heights to avoid The Walk as much as possible, but for anyone else that’s brave enough to go along it’s a completely harmless film that’s made an unforgettable one when it actually decides to walk the walk. 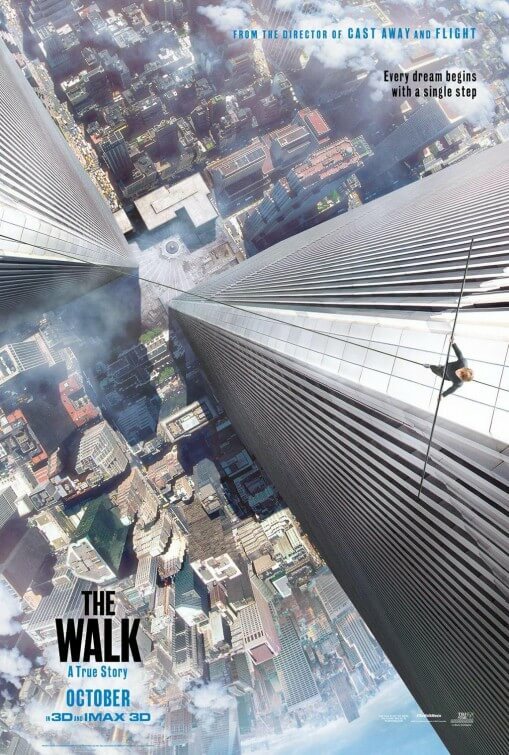 The Walk is unlikely to inspire the levels of appreciation that Man on Wire received, and with a few wobbly narrative choices that are made to dramatize the story it’s easy to see why, but the pure visual scope of being up there with Phillipe Petit as he walks across the Twin Towers that is made possible by the nerve-wracking IMAX 3D element is absolutely worth the price of admission.